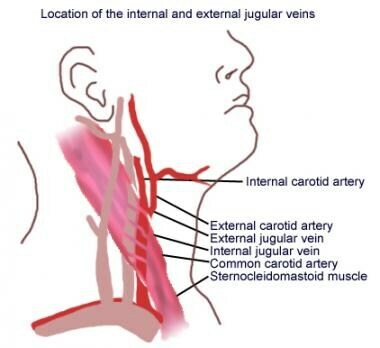 The indications for external jugular vein (EJV) central venous access are generally the same as those for all other routes. Although the list below is all-inclusive, not all of these indications are considered prudent or possible in each individual patient (eg, a dialysis catheter may be too large for the caliber of the vessel in some patients). 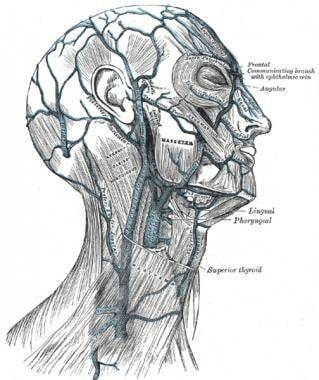 The EJV is formed primarily by the confluence of the retromandibular and posterior auricular veins near the angle of the mandible (see the first image below). It remains superficial in the neck and is loosely fixed in the subcutaneous tissues, traversing the sternocleidomastoid (SCM) obliquely just deep to the platysma (see the second image below). As the EJV nears the clavicle, just lateral to the insertion of the lateral head of the SCM, it pierces the deep fascia and receives other tributaries just prior to emptying into the subclavian vein lateral to the termination of the IJV. Delayed complications tend to mirror those of other access sites, which include infection, thrombosis, and catheter malfunction. In deciding on a site for vascular access, many things must be considered. Of primary concern is minimizing risks while maximizing patient benefit and comfort. The choice of route depends on patient historical and demographic factors, the plan of care, the device to be used, the provider's experience, and the known success and complications rates of the desired technique. The IJV, the SCV, and the femoral vein are the typical sites for central line placement; each site has its own risks and benefits. Another viable option for access is through the EJV. Use of the EJV for central venous access has been akin to the swing of a pendulum. Although this approach is not considered a universal favorite, it has certainly gained a following and has proved safe and reliable in appropriately selected populations. Anatomic factors and variability may lead to difficult or even failed catheterization. Numerous individuals do not have a palpable or visible EJV. Also, the presence of an acute angle between the EJV and the SCV, the presence of valves, and constriction of the EJV as it penetrates the fascial layers can contribute to a difficult catheterization. Because the EJV is superficial to the IJV and the carotid artery, it is important to make sure that the skin is entered at a shallow angle (~10-25°). To prevent pain and movement, anesthetic should be subcutaneously infiltrated at the anticipated site of catheter and suture placement. This can be done after initial venipuncture if the wire-through-catheter method is used. In a prospective observational human study, Kato et al found that computed tomography (CT) venography was useful for preoperative anatomic estimation of the cervical venous plexus. They suggested that the EJV approach with CT venographic guidance is worth considering as the initial method when central venous cannulation must be performed under less than optimal conditions. In 1974, Blitt described the technique with the use of a J-tip wire guide, citing a success rate of 96% and a 0% complication rate. In subsequent studies, technical success rates ranged from 73% to 88%. Advantages to using the EJV for central venous access include its superficial position and its distance from vital structures, which decrease the risk of major complications such as pneumothorax. Wang P, Wang Y, Qiao Y, Zhou S, Liang X, Liu Z. A Retrospective Study of Preferable Alternative Route to Right Internal Jugular Vein for Placing Tunneled Dialysis Catheters: Right External Jugular Vein versus Left Internal Jugular Vein. PLoS One. 2016 Jan 11. 11 (1):e0146411. [Medline]. [Full Text]. Byth PL. Evaluation of the technique of central venous catheterisation via the external jugular vein using the J-wire. Anaesth Intensive Care. 1985 May. 13 (2):131-3. [Medline]. Uvelin A, Kolak R, Putnik D. External jugular cannulation is irreplaceable in many situations. Resuscitation. 2010 Jun. 81 (6):773; author reply 774. [Medline]. Cho SK, Shin SW, Do YS, Park KB, Choo SW, Choo IW. Use of the right external jugular vein as the preferred access site when the right internal jugular vein is not usable. J Vasc Interv Radiol. 2006 May. 17 (5):823-9. [Medline]. Blitt CD, Wright WA, Petty WC, Webster TA. Central venous catheterization via the external jugular vein. A technique employing the J-WIRE. JAMA. 1974 Aug 12. 229 (7):817-8. [Medline]. Dailey RH. External jugular vein cannulation and its use for CVP monitoring. J Emerg Med. 1988 Mar-Apr. 6 (2):133-5. [Medline]. Segura-Vasi AM, Suelto MD, Boudreaux AM. External jugular vein cannulation for central venous access. Anesth Analg. 1999 Mar. 88 (3):692-3. [Medline]. Sparks CJ, McSkimming I, George L. Shoulder manipulation to facilitate central vein catheterization from the external jugular vein. Anaesth Intensive Care. 1991 Nov. 19 (4):567-8. [Medline]. Kagawa T, Ueyama S, Kobayashi T, Okabayashi H, Kuroda S, Fujiwara T. A novel "shrug technique" for totally implantable venous access devices via the external jugular vein: A consecutive series of 254 patients. J Surg Oncol. 2017 Mar. 115 (3):291-295. [Medline]. Kosaka M, Oyama Y, Uchino T, Ogihara Y, Koga H, Shingu C, et al. Ultrasound-guided central venous tip confirmation via right external jugular vein using a right supraclavicular fossa view. J Vasc Access. 2019 Jan. 20 (1):19-23. [Medline]. Karaaslan D, Altinisik U, Peker TT, Nayir E, Ozmen S. External jugular vein catheterization using 'intra-atrial electrocardiogram'. Yonsei Med J. 2009 Apr 30. 50 (2):222-6. [Medline]. [Full Text]. Nishihara J, Takeuchi Y, Miyake M, Nagahata S. Distribution and morphology of valves in the human external jugular vein: indications for utilization in microvascular anastomosis. J Oral Maxillofac Surg. 1996 Jul. 54 (7):879-82. [Medline]. Jaroch M, Steiger E. Rapid identification of the external jugular vein. Cleve Clin J Med. 1990 Jan-Feb. 57 (1):95-6. [Medline]. Kato K, Taniguchi M, Iwasaki Y, Sasahara K, Nagase A, Onodera K, et al. Central venous access via external jugular vein with CT-venography using a multidetector helical 16-section CT. J Invest Surg. 2014 Jun. 27 (3):176-82. [Medline]. Chakravarthy M, Krishnamoorthy J, Nallam S, Kolur N, Faris A, Reddy K, et al. External jugular venous route for central venous access: our experience in 563 surgical patients. J Anesth Clin Res. 2011. 2 (6):1-5. [Full Text]. Surface anatomy of neck. Large arrows point to external jugular vein. Central venous access via external jugular vein. Special thanks to Doctors Adria Winter and Anh Nguyen for videotaping the procedure.